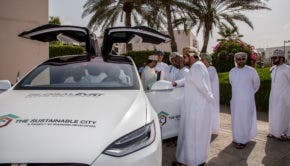 Governments across the Middle East are privately well aware of the threats that climate change, water scarcity, soil erosion, and food and energy scarcity pose to their continued existence, officials documents obtained by INSURGE INTELLIGENCE have revealed. These problems compound to form a threat of “unimaginable proportions,” according to the documents in question from the Organisation for Islamic Cooperation (OIC) — the second largest intergovernmental body in the world after the United Nations, consisting of 57 member states spread across 4 continents. The documents in question were produced by the OIC’s Standing Committee on Scientific and Technological Cooperation (COMSTECH). They are essentially agendas for discussion between government ministers that were used at the OIC’s inaugural Science and Technology Summit in September. 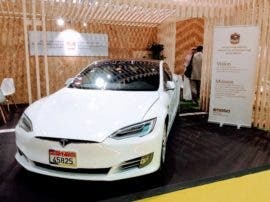 Tesla Model S in Abu Dhabi, UAE. What’s particularly interesting here, though, is that while there’s a version of the documents discussed above available on the website of the OIC, the ones obtained by INSURGE differ in a number of regards. “However, INSURGE exclusively obtained an earlier draft version of the document which differs in critical respects from the final published version. While both versions of the agenda acknowledge concerns over major, food, water and energy challenges, the earlier draft version contains a number of strong statements — subsequently deleted — indicating how serious some of these issues are viewed internally by OIC governments. “Noting that OIC member states are currently facing urgent ‘food safety and security’ problems, the draft document states candidly: ‘Most OIC member states are running out of usable land and water. The urgency of the matter calls for all measures to maximise outcomes from the least amount of water, as well as achieving universal and equitable access to safe drinking water.’ This paragraph was removed wholesale from the final version of the agenda, made public on the OIC website. That is one surprisingly blunt statement. Undeniable in any real way, but good luck getting practically anyone to publicly admit as much. The reality is that the “green revolution” was really just a wholesale looting of the world’s topsoil for a short-term boom in agricultural productivity (and human population) at the expense of practically everything else in the world — enabled through the use of mined fertilizers and novel pesticides and herbicides (with a limited time period of efficacy, owing to the fast-producing and mutating nature of pest organisms and weeds). “While the document contains some welcome acknowledgement of climate change, differences between the draft and final versions suggest that the gravity of concerns are being downplayed. “The document observes that: ‘Climate change is of particular concern for OIC Member States lying in climate-sensitive regions which are already aggravated by desertification, drought, degradation of land and water, especially the marine environment and fisheries therein’. It’s not too surprising that a statement like that, assigning the coming problems to human behavior, were removed — as that’s par the course for much of the modern world, where the taking of responsibility is considered to be a sucker’s game by most. As regards the mediocre “solutions” mentioned at the start of the article, it’s worth noting that the official document signed off on by OIC member states in September “predicts” that fossil fuels will still possess a 60–65% share in the primary energy mix of most member states in 2040. That’s a “prediction” that’s pretty hard to take seriously. The accompanying comments that renewables are unable to provide supposedly necessary baseload electricity generation, and that such ability can only be provided by nuclear or by fossil fuels, adds to this impression. As does the renewables target put forward in the document of only 10% by 2025, and the unrealistic pro-nuclear hype present in many parts. So, how to take all of this? Business-as-usual for as long as possible seems to be the plan — putting the OIC members in line with much of the rest of world, PR aside. I’ll note, though, that the documents do include some parts which I like: strong language supporting the recycling of urban wastewater; reduced water use in agriculture; the implementation of independent energy systems for small communities; the increasing use of geothermal; and the further development of solar PV, battery technologies, and molten salt storage, amongst other things. It’s just that that is nowhere near enough to avoid any of the fast approaching and/or growing problems discussed above.